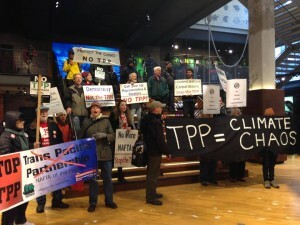 The corporate push for the Trans-Pacific Partnership (TPP) is on. We need your help pushing back. Last week, the Business Roundtable, U.S. Chamber of Commerce and other corporate lobbies formally launched their campaigns to get the TPP passed early this year. TAKE ACTION NOW: Please contact your Members of Congress and urge them to oppose calls to pass the TPP in early 2016 and beyond. The TPP would have a tremendously harmful impact on U.S. jobs and wages. But it doesn’t end there. The TPP is also a disaster for the environment, food safety, access to medicines and democracy itself. What more should we expect from a trade deal that was negotiated behind-close-doors with the aid of hundreds of corporate advisors, while the public and press were shut out? Oregon Fair Trade Campaign joined our national allies in a united cross-sector movement of labor, environmental, family farm, consumer, faith, LGBT, women’s, student and other groups in delivering a letter signed by over 1,500 organizations calling on Congress to oppose the TPP. Our “movement of movements” is getting stronger every day. Understanding that they’re really in a “now or never” moment, corporate interests groups are pushing hard for a TPP vote this year. But if we push back hard enough, we will overcome them. Please take action now by urging your Members of Congress to say NO to the TPP.